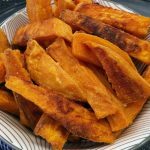 Have you been as frustrated as me about all of the different lists, which don’t always agree with each other…. ??? And sometimes you come across an item of food which is listed as high histamine but also have antihistamine properties….. It is so confusing at times. 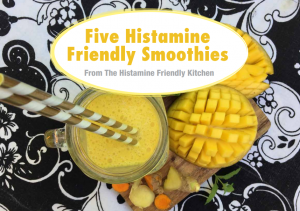 All in all, I really think it is important to focus on the fact that there is NO “one list fits all” when it comes to histamine intolerance. 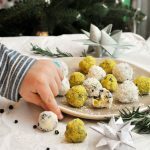 It is all about listening to your body and creating your own list – what is good for me and what is not good for me? That is the question only you can truly answer. And remember this also evolves over time, so keep reevaluating your list. Stinging Nettle is one of those food items which are listed high in Histamine, and has anti histamine properties. I have been using it in small quantities in my Antihistamine Tea Blend for long time now, but I had been wanting to try making soup from Stinging Nettles for a long time. However I wanted to wait until I was further along in my healing process. The soup is quite simple and quick to make, and here is what you need to do….. First find a good place to pick the nettles. I have them growing in my garden, so that step was quite easy for me. You want to only pick the young tops of the nettles. When you get them home give them a rinse. For the soup cut up 1 (white) onion, saute the onion with a little (extra virgin) olive oil. When the onion has turned translucent, add 2 cloves of garlic (minced) and let it all cook for another minute. Then add the courgette (cut into little cubes), turmeric and ginger (finely chopped) and let it all cook on low heat for about 5-10 minutes. Then it is time to add the nettles, arugula and broth/stock. You can use bone broth, vegetable stock, a tolerated bouillon or plain water and salt. Bring it all to a boil and let it simmer for 5 minutes, with the lid on. Then blend it until you have a thick creamy and smooth green soup. 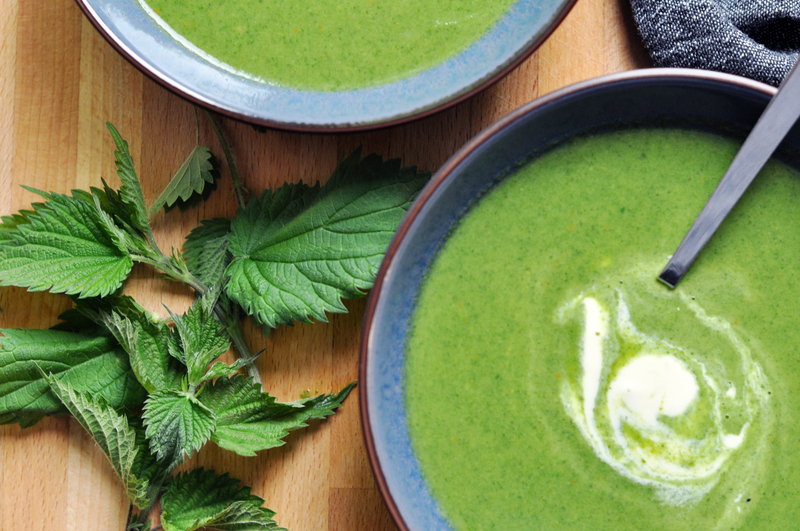 While this soup is an anti-inflammatory power house, nettles are still medium to high in histamine, so I don’t recommend trying this soup during the elimination phase. Wait a bit until your system has settled a bit and you have started to heal. 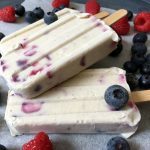 If you really want to try this recipe, but aren’t quite ready to try out the nettles – you can replace the nettles with extra arugula. 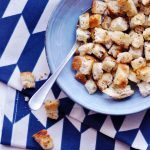 This soup really benefits from a little acid, so you can add a little crème fraîche like I did, or coconut yogurt if you are dairy free. 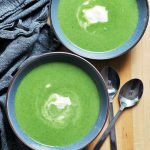 Otherwise adding a little sour apple together with the courgette, should do the trick 😉 I hope you will enjoy this nourishing Anti-Inflammatory Nettle Soup. 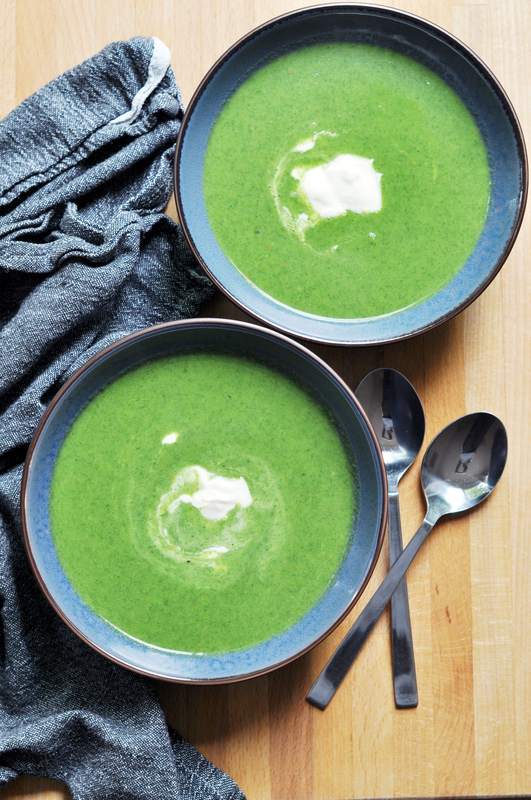 This soup is an anti-inflammatory power house and is deliciously thick smooth and green. Please do note that nettles are medium to high in histamine as well as having antihistamine properties. I don’t recommend trying this soup during the elimination phase. First find a good place to pick the nettles. I have them growing in my garden, so that step was quite easy for me. You only want to pick the young tops of the nettles. When you get them home give them a rinse. Cut up 1 (white) onion, saute the onion with a little (extra virgin) olive oil. When the onion has turned translucent, add 2 cloves of garlic (minced) and let it all cook for another minute. Then add the courgette (cut into little cubes), turmeric and ginger (finely chopped) and let it all cook on low heat for about 5-10 minutes. Add the nettles, arugula and broth/stock to the pot, bring it all to a boil and let it simmer for 5 minutes, with the lid on. Blend the soup, till you get a thick smooth green vegetable soup. 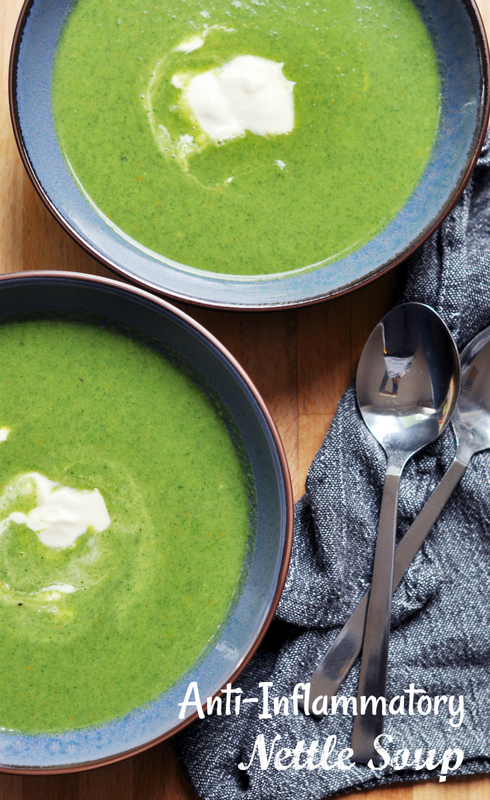 Serve with a little crème fraîche and I hope you will enjoy this nourishing Anti-Inflammatory Nettle Soup. You can use bone broth, vegetable stock, a tolerated bouillon or plain water and salt. 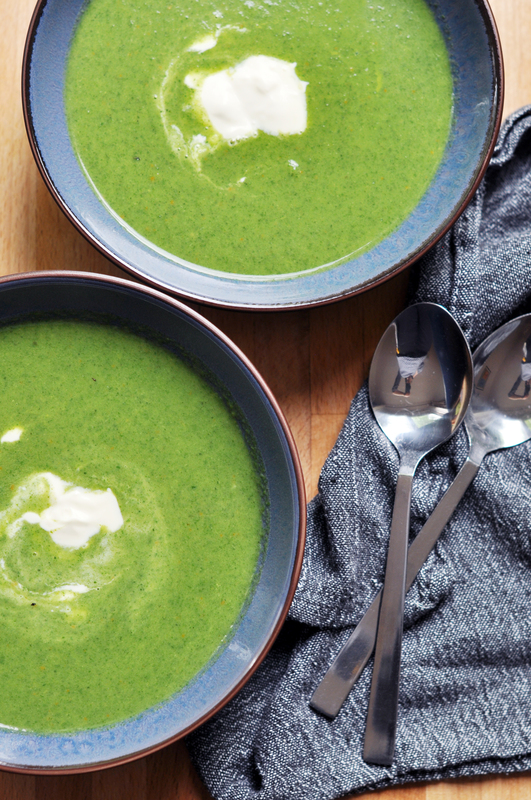 This soup was originally inspired by the recipe for Nettle Soup from Lisette Kreischer’s book “The Plant Pharmacy“. The book is unfortunately only available in Dutch at the moment, but I hope that it will be translated to English at some point. 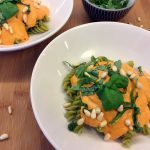 I chanced the recipe, to make it more histamine friendly, by replacing a large part of the nettles with arugula and added ginger and turmeric to pump up the anti-inflammatory ingredients.